Zayo agreed to acquire Litecast/Balticore , a provider of metro Bandwidth Infrastructure services in Baltimore, Maryland, for $22 million. 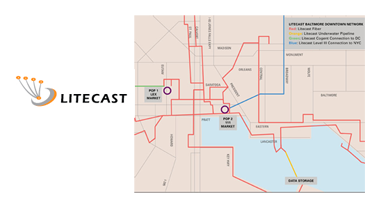 Litecast owns and operates a metropolitan fiber network connecting over 110 on-net buildings in Baltimore, including all of the city’s major data centers and carrier hotel facilities. Litecast is focused on providing dark fiber and Ethernet-based services to a concentrated set of Baltimore enterprise and governmental customers, particularly within the healthcare and education segments. Zayo said the acquisition boots its own fiber network in the greater Baltimore-Washington metropolitan area, complementing the recently acquired AboveNet and FiberGate networks in the Washington, D.C. and Northern Virginia area. Telenor restated its intention to become a major player in the Indian communications market by committing INR 155 billion to its operations there. In the most recent spectrum auction, Telenor secured 5 MHz spectrum in UP East, UP West, Bihar, Andhra Pradesh, Gujarat and Maharashtra. 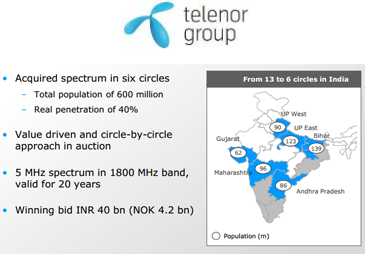 In combination with the planned business transfer from Uninor to a new entity, this allows Telenor’s India operations to continue seamlessly in the new company for a period of 20 years. Telenor noted that its Indian operations already enjoy decent market positions in terms of subscriber and revenue market share in all six circles. The company is aiming to take a number 2-3 position in its of the clusters where it participates.